The EMR (Emergency Medical Responder) is a vital part of the Emergency Medical Services (EMS) system. The EMR is trained to get there first-the point when a difference can be made between life and death. 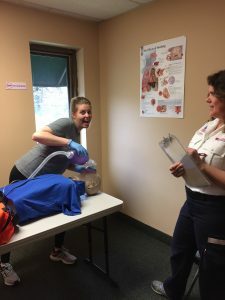 The training you are about to undergo is focused on just that the knowledge and skills to save a life, to comfort a patient at the height of the crisis, and to provide care that flows seamlessly into the care given by emergency personnel on the ambulance. The EMR blended program (48 hours total), includes classroom instruction 30 hours, lab time, 5 practical skill stations and a written exam. 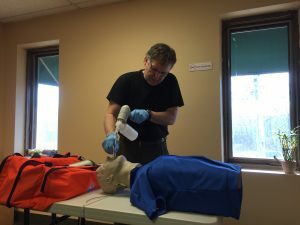 We will cover Airway, Cardiac arrest management, Bleeding control, Back boarding, Splinting and Vital signs. Patient assessment is the main focus of this course. Day, Weekends and Evening sessions. See the calendar for schedules. AHA BLS CPR online access for 2 years, skills only in class; for New courses only. PLEASE bring a copy of your completed Heartcode online certificate to class. Pearson Online program with eText, Multimedia, quizzes, flashcards, audio text, code is available for 2 years. You can access MyLab BRADY from Blackboard Learn, Bright space by D2L, Canvas, or Moodle. You will receive an email from AHA to take the course. Expect the HeartCode® BLS course to take 2-3 hours online, with an exam. Print the completed certificate and bring to class.